FILE PHOTO - The ticker symbol for United Technologies is displayed on a screen on the floor of the New York Stock Exchange July 20, 2015. Aerospace supplier United Technologies Corp has struck a $30 billion agreement to buy avionics and interiors maker Rockwell Collins Inc, the companies said on Monday, in a deal that bulks up UTC’s power with plane makers by creating one of the world’s largest makers of civilian and defense aircraft components. 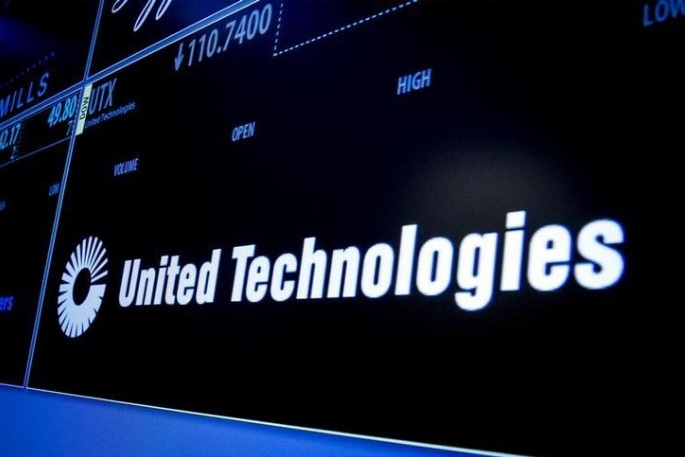 Farmington, Connecticut-based United Technologies will pay $140 per share for Rockwell Collins, split between $93.33 per in cash and $46.67 in stock, according to the companies. The price represents a 17.6 percent premium to Rockwell’s $119 share price before news of the talks emerged on Aug. 4. Shares of Cedar Rapids, Iowa-based Rockwell Collins closed at $130.61 on Friday. U.S. markets were closed on Monday for the Labor Day holiday. The acquisition price implies a total transaction value of $30 billion, including Rockwell Collins’ debt, and a total equity value of $23 billion. United Tech said it plans to fund the cash portion through debt issuances and cash on hand. Under the deal, the companies said that Rockwell Collins and UTC’s aerospace systems segment will be combined to create a new business unit named Collins Aerospace Systems. “This acquisition adds tremendous capabilities to our aerospace businesses and strengthens our complementary offerings of technologically advanced aerospace systems,” UTC’s chairman and chief executive officer, Greg Hayes, said in the statement. “Together, Rockwell Collins and UTC Aerospace Systems will enhance customer value in a rapidly evolving aerospace industry by making aircraft more intelligent and more connected,” he said. The creation of a new giant in the top echelon of aircraft parts makers comes as planemakers Boeing Co and Airbus SE are trying to capture more of the profits earned by their suppliers. Both are pushing suppliers to lower prices and are moving into the high-margin aftermarket arena for parts and services that suppliers now enjoy. Last week, Airbus urged supplier UTC to stay focused on fixing industrial problems that have delayed new aircraft deliveries. If plane makers “are going to take more of the aftermarket or demand more of the aftermarket, we’re going to have to think about how we price our products,” Hayes told analysts in July. By making more of the components needed on each aircraft, analysts say, United Technologies likely will gain some leverage to resist such pressures. The deal also follows a wave of consolidation among smaller aerospace manufacturers in recent years that was caused in part by the need to invest in new technologies such as metal 3-D printing and connected factories to stay competitive. A combined United Technologies and Rockwell Collins could similarly invest, and their broad portfolios have little overlap. United Technologies makes Pratt & Whitney jet engines used by Airbus, Bombardier Inc, Embraer SA and other plane makers. It supplies engines for Lockheed Martin Corp’s F-35 Joint Strike Fighter. It also supplies such key components as landing gear, air conditioning systems and engine covers to a wide range of jetliners. Rockwell Collins is a major avionics supplier to Boeing and Airbus and other plane makers. In April it added passenger seating, cabin interiors, lavatories and galleys through its $6.4 billion acquisition of B/E Aerospace. United Technologies expects to close the purchase in the third quarter of 2018. The company, with a $94.2 billion market value, also owns Otis Elevator and air conditioner maker Carrier. The deal, which includes $7 billion in Rockwell’s debt, is expected to save more than $500 million by the fourth year after its completion, the companies said. J.P. Morgan Securities LLC and Citigroup Global Markets Inc were Rockwell’s financial advisers, while Skadden, Arps, Slate, Meagher & Flom was its legal adviser.